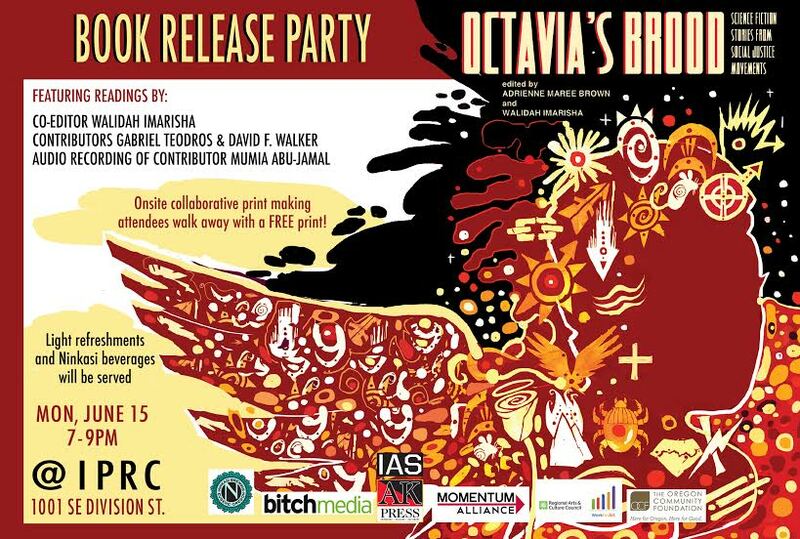 Octavia's Brood: Science Fiction Stories from Social Justice Movements Portland Book Release! Come celebrate the release of the new anthology Octavia’s Brood: Science Fiction Stories from Social Justice Movements! Onsite collaborative print making with attendees–walk away with a FREE print! Whenever we try to envision a world without war, without violence, without prisons, without capitalism, we are engaging in an exercise of speculative fiction. Organizers and activists struggle tirelessly to create and envision another world, or many other worlds, just as science fiction does… so what better venue for organizers to explore their work than through writing original science fiction stories? Co-editors Adrienne Maree Brown and Walidah Imarisha offer us Octavia’s Brood: Science Fiction Stories from Social Justice Movements, as a way to uncover the truths buried in the fantastical – and to inject a healthy dose of the fantastical into our search for truth.